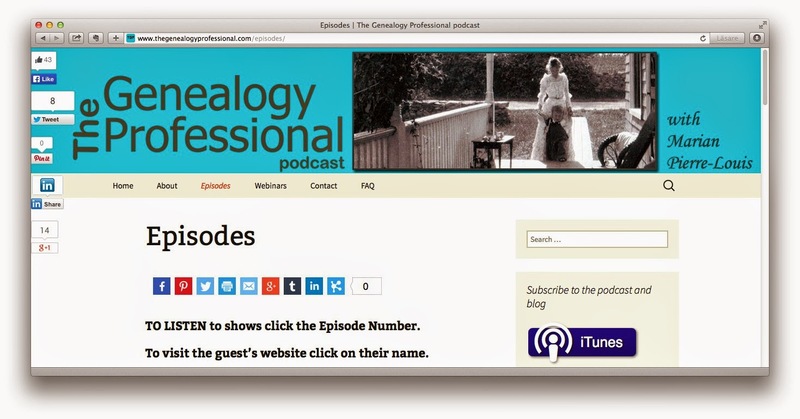 Not to long ago I discovered The Genealogy Professional podcast hosted by Marian Pierre-Louis. In every episode she talks to someone who made genealogy their profession in some way. It is truly an inspiration to listen to people who make their living in the genealogy field. If you are able to find your special niche it is possibly to do what you really love full-time. It is the same questions that is discussed in every episode, like how they got started, what was their biggest fear and what advice they have for others who would like to start a genealogy career. The episodes are between 35 minutes to an hour long. About fifty percent of the guests are in the US but also from other countries like Australia, England and Israel. Great podcast, check it out, you can listen to it in iTunes or at The Genealogy Professional podcast.